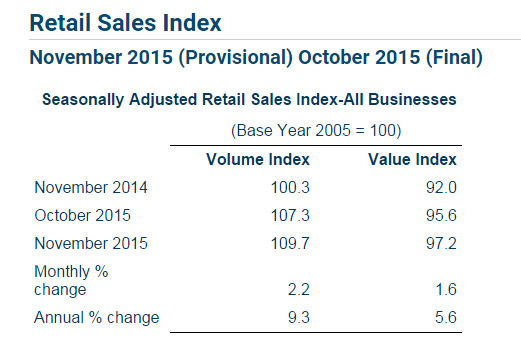 Heading into the Christmas trading period, the Irish sector saw a big rise in the volume of retail sales in November. Data from the Central Statistics Office showed that sales were 9.3% higher on the same month a year earlier, and up 2.2% on the previous month. Buoyed by Black Friday activity, sales of electrical goods were up 13.6%, while department stores volumes increased by 7.4%. Food retailers experienced the lowest growth at just over 5%. 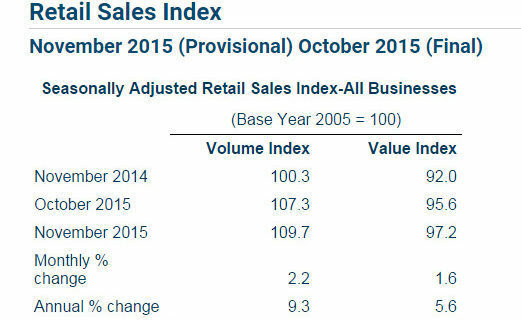 There was an increase of 1.6% in the value of retail sales in November 2015 when compared with October 2015 and there was an annual increase of 5.6% when compared with November 2014. If Motor Trades are excluded, there was an increase of 2.0% in the value of retail sales and an annual increase of 4.9%.